Karnataka is a state where there are a large number of Jain temples and pilgrimage sites. Due to the historical association of this religion in the state, it flourished under the patronage of many powerful rulers across different dynasties in different centuries. Of these places, Sankighatta is one of the most important places in this state. 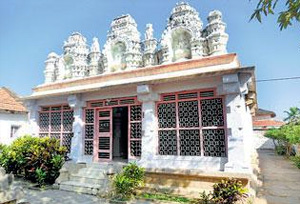 This is where you will find the Dallina Vardamana Mahaveera Jain Temple. This temple is dedicated to the 24th and last Tirthankara, Mahavir Bhagwan. The date of the temple has been traced back to the 11th century. It was built by the Emperor Narasimha I who ruled under the Hoysala Dynasty. The patronage of the temple was given over to the Settru family members whose descendants are still keeping the tradition alive and intact, although they have given over the care of the temple to the Tahsildar of Magadi Taluk in the year 1950. The main deity is that of Bhagwan Mahavir and the statue is made of five metals, called panchaloha. This idol is unique in the Jain tradition because the Tirthankara is depicted as a little boy who has a smiling face and is of golden color. This was originally a black stone idol but was damaged due to various reasons. This was then replaced with the metal idol, although the original black idol can still be seen placed behind the metal one. The most famous festival of this temple starts on Diwali day and lasts for a month. This day is also Karthika Amavasi day and is considered auspicious among Hindus. This day is also the of Mahaveer Swamy Moksha Kalyana.